Spring is here. Yay! We can turn down the heat a few degrees, the birds are starting to sing outside early in the morning, the first BBQ plans of the year are being made and... the annual spring cleaning needs to be planned! Check how long it has been since you did any maintenance on your vertical wood. If you have done it in the last 3 to 5 years, you don’t need to do it now. If it has been more than 3 to 5 years, we will give it a thorough cleaning this year. Next, check if your horizontal and vertical exterior wood has any moss growth. If your exterior wood does not have any moss growth, follow these steps. We are going to freshen up the colour of the wood and protect it with the RMC Hybrid Wood Protector, in the originally chosen colour. If your exterior wood does have moss growth, follow these steps. 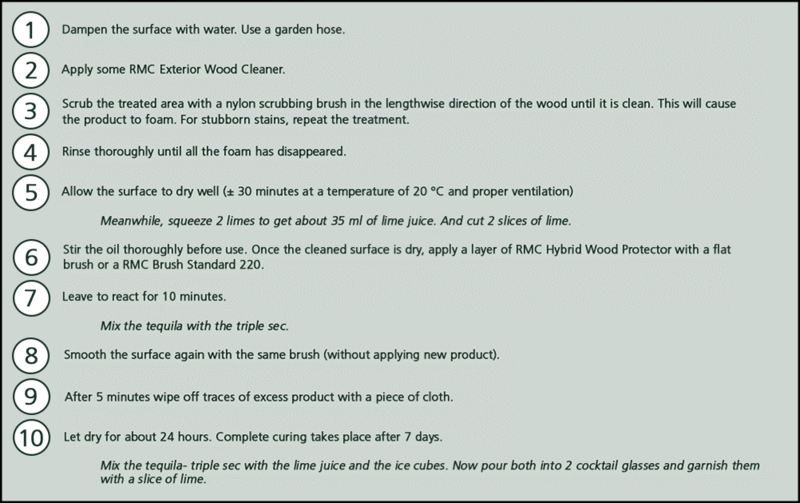 We are going the clean the wood first with the RMC Exterior Wood Cleaner and then we are going to freshen up the wood and protect it with the RMC Hybrid Wood Protector. Now you are completely done cleaning and freshening up your exterior wood surfaces. All you need to do now is enjoy the result. And drink your freshly made margarita. Because you more than deserve it!